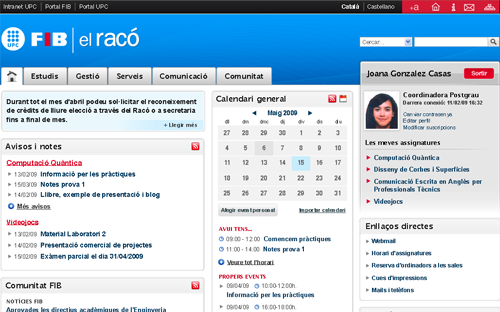 El Racó is the school’s intranet, which is accessible to all students, faculty and administrative staff. El Racó is intended to be the gateway to all services offered to different groups of people and therefore is integrated or linked to different information systems. El Racó has been around since 1995 and has undergone several renovations, the last one in 2011. It was internally restructured and was given a new more modern graphic design, and also a usability study was performed. El Racó is an ongoing project in which new features are continually being added. Since it was first launched, enhancements have been developed, some of which are explained as separate projects, an example would be the management of Degree Final Projects. View notices, scores and calls for examination. Participate in forum discussion started by the professors of a subject. Hand in projects or practical activities. View and fill out the ECTS surveys of a subject. View, run and vote for the student representative of a subject. View the professors of a subject. View the different groups of a subject’s schedule. Insert the specifications, abstract and keywords of the Master’s final project. Insert the preliminary report, the date of reading, specifications, abstract and keywords of the Degree’s final project. Viewing the news of student associations. List of the student representatives of the classes you are enrolled. Reservation of equipment (inLab FIB and ESAII). Viewing your registration turn number and what subjects you may enroll (during registration periods). Personalization (personal info, personal website, interesting links). Seeing the profiles and the level of achievement of each subject. Office procedures (change of groups, application the validation of elective credits). Signing up for the Selective Phase workshops (only students on the selective phase). Class list in different formats. Manage notices, scores and calls for examination. Open forum discussion threads for a subject. Set up the delivery of projects and practical activities. Access the disk’s partition for the subject. View the results of the ECTS surveys. Keep the syllabus information in the three official languages. Preserve the information of the professors assigned to the subject. Propose Final Project offers, view information on the projects you have participated, request resources for students doing their final project, view preliminary reports and specifications of the final projects. Viewing school policies and other information. Follow up students you are tutoring.